Do I have to be an “artist” to participate? No. Meadows School of the Arts is developing this project and platform. 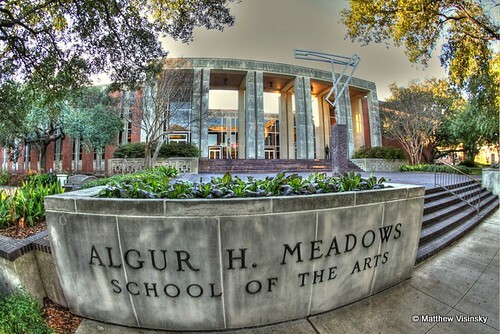 As a result, the name chosen for the project reflects the name of the college in which it resides (Meadows School of the Arts). Many Meadows students do not think of themselves as artists, necessarily, but as creative individuals or “creatives”. This project is a work in progress and the department that piloted the program is the Department of Music, thus their students’ exclusive profiles on the site at present. However, in the near future, several other departments will be represented through the Meadows Artist Bridge. It is hoped that, in time, the Meadows Artist Bridge will become a go-to source for creative talents of many mediums and represented professions. What if I don’t want to accept work that I am approached with? No student is required to participate and no student must take every offer they are presented with. How do I apply for the Meadows Artist Bridge? You can do so through a form site that will be distributed to your respective department, following Chair approval. What if I don’t major in the category I would like to apply for? This is OK. You can apply for whatever category you believe you qualify for, provided that you list your Major and current year of study (ex. Journalism, Junior). Where can I find the rubric for applying for the Meadows Artist Bridge? Each department’s rubric will be different and based on the department’s structure, students’ skill sets and educational offerings. known as the Gig List has been renamed and re-branded as “Meadows Artist Bridge”. This is because the new website created to introduce student creatives and artists to the professional community serves as a bridge between those who seek to hire Meadows students and those artists and creatives who wish to work, while still in school. Those who seek to hire Meadows students will now have opportunity to scroll through students’ online profiles/portfolios and sample their work through students’ postings of Soundcloud files, video, photos and text and make informed decisions as to whom they wish to hire. Simultaneously, participating students have opportunity to design their profiles and samples in a way that enables them to learn to effectively compete for commercial work, just as many graduates of Meadows will have to do following graduation. The Meadows Artist Bridge serves as an extension of the classroom, offering real-world experience and the potential for pay while students are still in school. 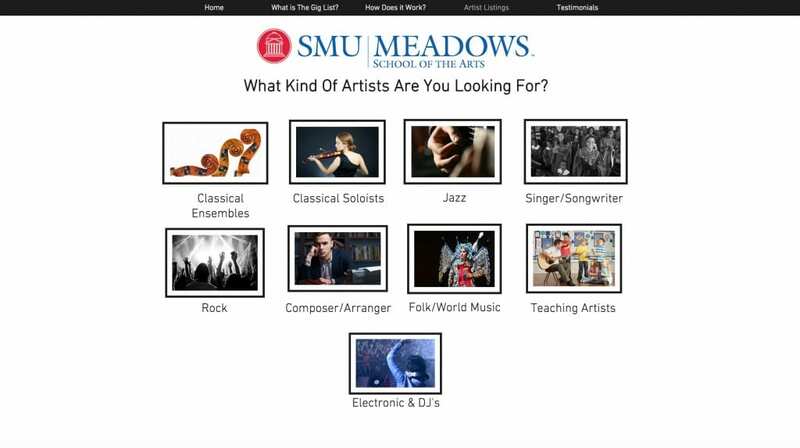 Students have opportunity to build their resumes, their online portfolios/resumes, develop their professional networks, establish a fan base, communicate with followers and then graduate able to use the website they have created for the Meadows Artist Bridge professionally. artists still seek referrals? Historically, Meadows’ departments receive phone calls virtually daily from people in the community who wish to hire Meadows students. This site serves, in part, to make that process more efficient and less cumbersome. has a desire to modernize the process of what was once called the Gig List, making the platform an extension of the classroom and enabling students to attain gigs by promoting their talent, rather than only through referrals. Where can I buy a domain address? Domain addresses can be bought from a number of sources. Godaddy has advertised .99 cent domains. Seek out reviews of services that offer domains and note their privacy policies when purchasing. Wix, with a subscription, offers a free domain for a year (at the time of this posting). In seeking a domain address, make sure that the company you purchase from has a review history of good customer service (or at least a good question and answer section/FAQ). Here is an article that offers suggestions on choosing and purchasing a domain. What sites can I create an Artist Bridge submission through? As long as your site looks like the standard submission, you can use any website platform you choose. It is important that student submissions (sites) look similar in aesthetic so that those hiring have an easy user experience and can quickly and easily see/hear samples, understand your services offered and read your text and find contact information. All platforms have plusses and minuses. However, when one looks at a competition matrix, a graph that compares popular platforms for online website building, Wix.com is typically ranked number one. Please see the following. list would not? The Meadows Artist Bridge is designed to enable students of Meadows to practice, in the market, the skills they are developing. Students are able to share their talent through audio, video, text, and imagery. Students can differentiate themselves from the competition through text (an important skill for post-graduation market entry). More, the current Meadows Artist Bridge design is created in a way that it builds upon the work done in the class FACE . In the 1st semester of the 1st year of the FACE class, students develop a video elevator pitch, consider their artistic voice, they articulate their mission statement and create a website–all skills that can be directly applied to the Meadows Artist Bridge. In fact, FACE students are strongly encouraged to create their FACE website in a way that qualifies them for participation in the Meadows Artist Bridge. create a look of uniformity within the platform of the Meadows Artist Bridge and enable ease-of-use for those offering jobs. Secondly, one of our goals at Meadows is to train students in how to be more entrepreneurial and to effectively and professionally work as artists and creatives in their respective fields. Meadows has a website and domain purchasing requirement for all incoming first-year students (through the FACE class). The continued process of having such a website and domain enables students to put the tools and skills they learn in FACE into action and potentially make money, develop their resumes/digital portfolios and expand their professional networks. This said, current students of SMU, can gain access to a free website through SMU WordPress. Can I have multiple profiles and if I do, do I need multiple websites? You may develop multiple profiles via a single web page. For example, if you are a musician, you might promote a band or quartet with one and promote yourself as a soloist with another. Wix does not restrict your number web pages. They only restrict the volume of data you put up, based on your chosen and paid-for subscription. Therefore, you can create many profiles through a single website. Can I share a website with others (and the costs)? This is up to you. You can have multiple profiles on one Wix account, but will be sharing a domain address with others. For those on a very tight budget, they might have one person provide the payment card and then split the cost and pay those with the card. Each would then have a shared domain, but with different extensions. Ex: One might have www.mydomain.com/susan, while the other has www.mydomain.com/joe. Several people can pool their resources. However, those hiring may refer to your website in the future. Choosing a domain is a good way to begin branding oneself. Therefore, it is advisable that each person establish their own domain address. What if there are only a few other students who apply for my same category? From an entrepreneurial perspective, this is the best-case scenario for students who are participating. In theory, as there would be less competition in this situation, those students who are promoting their websites should receive the “lion’s share” of work coming in for their category. This could create a luxury dilemma of having too many gig requests. I purchased a domain in the FACE class. Can I transfer my domain from my current website to my Meadows Artist Bridge profile on Wix? Yes, if it is still active. Please see this site as to how to do so. Can I later adapt or change my Meadows Artist Bridge website/profile? As long as you consistently adhere to the approved rubric for the Meadows Artist Bridge website, you are able to change your personal content. In fact, all students are urged to do so, based on what they perceive is helping them differentiate their own talents and get more gigs. Feel free to change your video, your story/text, your pictures, audio samples, updates on who or what companies you have worked for and other relevant information that those hiring may want to know. Keep your Meadows Artist Bridge profile updated so that prospective Meadows Artist Bridge customers (those wishing to hire you) can follow your developing success. What happens to my site when I graduate? Part of a recent policy change, graduates of Meadows can now remain listed on the Meadows Artist Bridge for up to one year after graduation. This will enable our graduate artists/creatives to potentially have a professional springboard, post graduation. How do I learn to set up my profile and site? The first step is to look at what others students have created on the Meadows Artist Bridge website. Emulate the look the others have created, which are based on the approved template. If you still have questions, contact Professor Dylan Smith in Music or Professor Jim Hart in Arts Management and Arts Entrepreneurship. Occasionally Smith and Hart conduct in-person workshop sessions on how to set up your profile. In these sessions, students’ questions are answered. Should I put my personal contact information on my web page? No. An SMU lawyer, who has reviewed this process, has asked that students do not share their personal information. Instead, students can use a Wix-based contact form. Doing so will enable people to reach the artist/s without their private information being shared and made available via the worldwide web. What if I already have a website? Can I use that? There is no reason to abandon a website you are currently using for professional purposes. If you can create one unique page that is part of your existing website that is white in color and resembles the look of the current Meadows Artist Bridge site and templates, you are welcome to use your existing site. What if I don’t want to create a Soundcloud file or buy a domain for the Meadows Artist Bridge? Domain address purchasing is not optional. It is required. Students who do not wish to do so are to be reminded that they do not have to partake in the Meadows Artist Bridge project, that doing so is optional. Students are not required to post recording samples or video samples. However, those who do will likely get much more work. Students should consider the perspective of their customers (those hiring). Many will want to hear what they are getting and it behooves you to promote your talent. What if I have a better idea for the Meadows Artist Bridge design? You are welcome to share your ideas. However, the design, as we are implementing, has been approved at the top level of the college of Meadows and is a design that serves many goals of the college and those who have planned this project. What if I don’t have a video elevator pitch? This year we will accept any video content students wish to offer, rather than a short video elevator pitch. However, those who do create such an elevator pitch (all FACE students have to do so) likely increase their chances of working, as people like to gain a sense of who they are hiring. Is Meadows serving as an agent with the Meadows Artist Bridge? 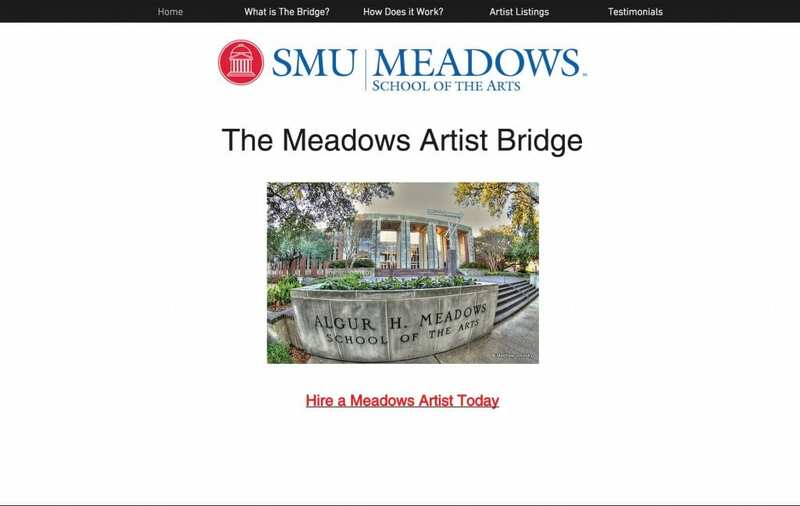 No, Meadows is not serving as an agent with offering this online version of the Meadows Artist Bridge. This new online platform serves the same function as the old system of names on a legal pad. However, this new digital system enables students to promote their own talent and develop effective means of marketing themselves. 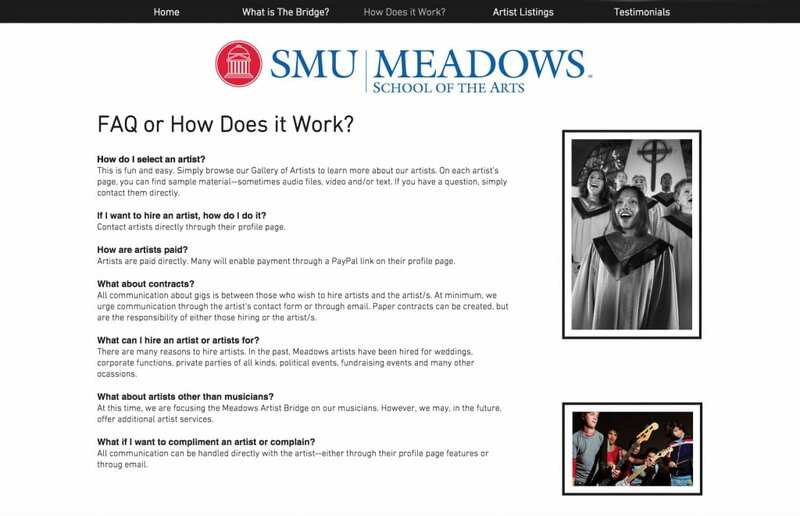 Meadows receives NO MONEY from the Meadows Artist Bridge platform. The Meadows Artist Bridge is simply a digital bridge (a website) that connects those who wish to hire Meadows artists and creatives and those creatives and artists who wish to work while still in school. Who handles the money I make from the Meadows Artist Bridge? Meadows does not serve as an agent. Students are responsible for all of their business matters pertaining to gigs they have that stem from the Meadows Artist Bridge website. The Meadows Artist Bridge is only a website featuring Meadows students who want to work professionally. Though the following is not legal advice (speak with an attorney for legal advice, if you wish), artists and creatives participating in the Bridge are urged to require those hiring to pay half of their gig/job fees before the gig/job and half afterwards, upon completion. Who handles my taxes for gigs I receive? Students are responsible for declaring their income, as per the laws stipulated by the IRS. Meadows is not responsible for and does not handle student money. Students are exclusively responsible for all aspects of their business. The Meadows Artist Bridge serves only as a bridge that connects those who wish to hire Meadows artists and creatives and those creatives and artists who wish to work. At no time will Meadows handle money from student gigs or have anything to do with the students’ tax matters. To understand what your legal responsibilities are regarding taxes and the reporting of income, consider speaking with a tax professional and or an attorney. Does the Meadows Artist Bridge stifle my creativity? No. Structure liberates creativity. As a play has a director who gives direction, a musician plays notes on a page and an opera singer is bound to the language they are hired to sing, creatives and artists commonly use structure to express their creativity. Structure gives form to creation. However, within that structure (in the case of the Meadows Artist Bridge the structure is the rubric and the Wix site), one can be as creative as they like. Be creative with your audio, the apps you choose to use, the story you communicate (or how you choose to brand yourself). Be creative in how you communicate with your subscribing audience through an online newsletter, if you choose to have one. Be creative with what picture or pictures you use to promote yourself with, perhaps with an online gallery. Your website/profile should promote your talent and do so, ideally, through samples of your talent (through audio and video files). Do I have to participate in the Meadows Artist Bridge? The Meadows Artist Bridge not a required service for students to participate in. The Meadows Artist Bridge is a voluntary platform that is offered to increase the chances of Meadows students working professionally while still in school. 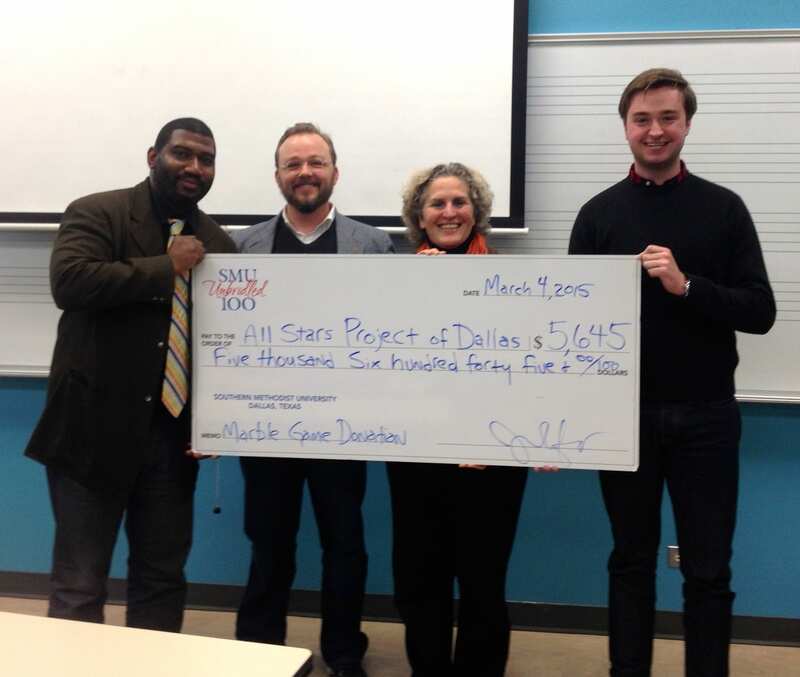 This FAQ page was created by Jim Hart, Director of the Arts Entrepreneurship program at Meadows School of the Arts, SMU. 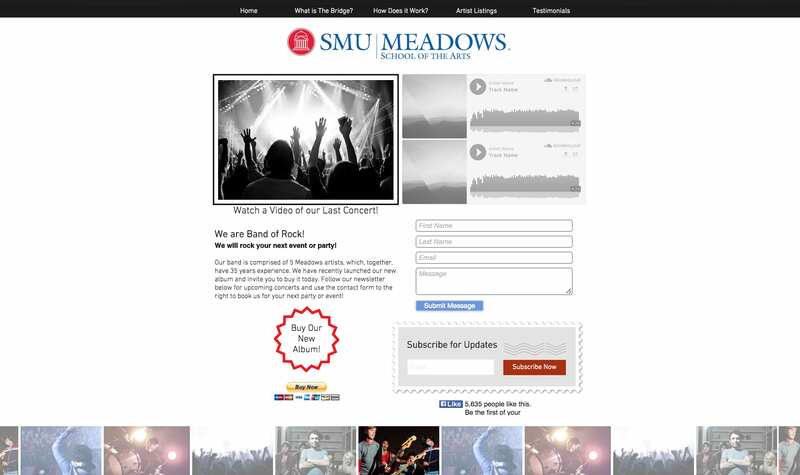 This entry was posted in Meadows Artist Bridge, Uncategorized and tagged arts entrepreneurship at SMU, Dallas, entrepreneurship in the arts, Ft. Worth, hire musicians DFW, How to hire local musicians, how to participate in the gig list, local musicians to hire, Meadows Artist Bridge, Meadows School of the Arts, music gig list, SMU. Bookmark the permalink.